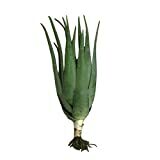 Aloe Vera Plant for Sale – It is a popular choice of plant and is easy to grow. 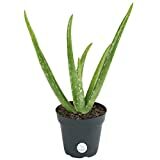 Before buying, know that Aloe Vera plant for sale in the stores is usually propagated from by detaching young clone plants from the base of the adult plant. Known for its ability to thrive in almost any condition, aloe vera grows well indoor or outdoor with minimal care. Aloe Vera, in contrary to many people think, is a succulent rather than a cactus. Its varieties range in size from 1 to 4 feet. And it comes in many colors and shapes including purple-tinged, orange-tinged, and with various spine configurations as well. 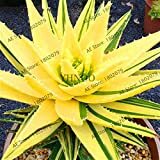 The best season to buy Aloe Vera plant is during the dry climates because they are composed of mostly water, it makes them susceptible to frost. The planting soil should be well-drained and the pot should have enough room for the root ball to grow. A cactus mix or sandy soil works well and a pot with a single large hole at the bottom is the best choice for Aloe Vera plants. Aloe Vera is tolerant of dry conditions but should be watered thoroughly during the summer. Just make sure soil is drained and dried up in between watering. During winter months, water them less frequently. Aloe Vera leaves grow upward from the base towards the direction of the sun. If the leaves lie flat, it probably needs more sunlight. If you are re-potting, do it during spring before the frost. Choose a container that is wider but not deeper than the previous. Aloe Vera propagates through offshoots which can be removed and replanted. Cut the offshoots once the leaves unfurl and allow it to dry over for a couple of days before planting it. You should give your Aloe Vera a bit of space because the mother plant will offset the “babies” from the outer base. If the plant is growing too slow, the soil or water might be too alkaline. It could also mean that the Aloe Vera was too damp for a too long, lacks sun exposure or has too much fertilizer. Aloe Vera, like any plant, can suffer from bugs, fungus and disease on its stems or roots. You should be mindful of the leaf rot which is a common ailment for aloe. Aloe Vera is a favorite plant of many gardeners not only because it is easy to look after but also because of its many uses and benefits. 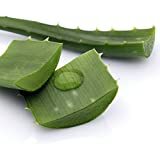 One of the most common usages of aloe is using its inner leaf gel as a topical remedy for burns, cuts and other skin irritations. This inner-leaf gel can also be consumed for collagen support, as a digestive aid, its immune supporting properties, and many other super food benefits. Or you can simply plant an Aloe Vera plant indoors for added aesthetic value to your home.